WELL, IT'S FINALLY HERE, and visitors to the centre seem to be unanimous in their praise. Others are less positive - Manchester city councillors, including Richard Leese and Pat Karney have been voicing their opposition for a long time. The Civic Society, whose magazine Forum is just out (online soon), is also very critical of the centre. I have mixed feelings: I was impressed by the amount of traditional style ornamentation. It's a pastiche of Classical, Byzantine and Egyptian designs. Thousands of pounds has been spent on gold leaf both inside and outside the centre. The interior palm trees, pot plants and classical sculptures call to mind the 1851 Crystal Palace or Kew Gardens, though the effect is spoilt a little by the "colour-by-numbers" wall paintings and plastic plants. But as I stood inside the centre, I felt as if I was teleported back to Dubai, and I'm not sure if I liked the feeling. Manchester expats visiting from the States may well feel they're back where they just came from. Themed areas modelled on exotic parts of the world such as Egypt, New Orleans and Venice help you imagine you're somewhere else, but actually, I'm quite happy to be in Manchester. As with many mass-market features of modern-day life, such as mainstream TV, the tabloid press, fast food restaurants and supermarket chains, professional critics are against them, but the public love them. So who's right? Take the interior decor of the Trafford Centre for example - I'm sure that most contemporary designers will hate the multi-coloured neo-Classical ornamentation, preferring the spartan, miminalist look seen in city centre bars and loft conversions. But I'm equally sure the general public will love the old-fashioned decor, and if that's what the public genuinely wants, then I think they should get it. Personally, I'll be staying with Manchester city centre - it's more convenient, more varied, more interesting, and it's a real environment with centuries of history and character. 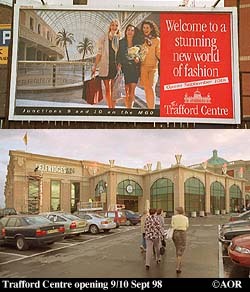 But I imagine I'll make the occasional trip to the Trafford Centre, though I'm not sure if I'll be buying: The prices in Debenhams appeared to be higher than in their Manchester city centre store. Website commissioned by Manchester Online and designed by Yours Truly, spotlighting the 7 Manchester Unsigned Bands featuring at this year's In The City music convention - Who knows, one of them may be the next superstars to emerge from Manchester. Listen to their music in Real Audio and judge for yourself! 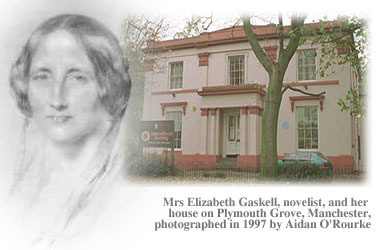 Elizabeth Gaskell, Writer MRS GASKELL PROVIDED US WITH A VIVID PICTURE of Manchester during the industrial revolution. Her first novel, "Mary Barton" took four years to write, but brought her overnight success. The subject matter is based on her experiences as the wife of William Gaskell, minister of Cross St Chapel, who spent his life helping the poor of Manchester. "Mary Barton" was very well received, though it was criticised by the apologist for Capitalism W.R. Greg, for being too sympathethic to the workers. The Manchester Guardian (Feb 28, 1848) also deplored ots "morbid sensibility to the conditions of the operatives" . She went on to write more novels, including "Cranford", based on Knutsford. A college in Manchester, now part of MMU, bears her name. Her house on Plymouth Grove is currently facing an uncertain future. More information on the Manchester Civic Society website. Maiden name: Elizabeth Cleghorn Stevenson Born: Chelsea, Sept 29 1810, daugher of a Unitarian minister Childhood spent in: Knutsford, Cheshire Married: Rev. William Gaskell, 1832, Knutsford; Addresses in Manchester: 14 Dover St, Chorlton-on-Medlock; 121 Upper Rumford St; 84 Plymouth Grove (from 1850). Died of a heart attack, Nov 12, 1865. Source: "Famous Manchester People" published by the City Council and the Local Studies Unit, Manchester Central Library. Also an article by "F.H.A.M." in the MEN Aug 30 1948.